Work is proceeding in 2011 on the restoration of the old Matador jail. Pictured is former Motley County Judge Ed D. Smith. Motley County is a county located in the U.S. state of Texas. As of the 2010 census, its population was 1,210, making it the tenth-least populous county in Texas. Its county seat is Matador. The county was created in 1876 and organized in 1891. It is named for Junius William Mottley, a signer of the Texas Declaration of Independence. Mottley's name is spelled incorrectly because the bill establishing the county misspelled his name. 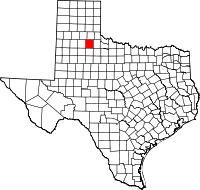 Motley County was one of thirty prohibition, or entirely dry, counties in the state of Texas, but is now a moist county. Republican Drew Springer, Jr., a businessman from Muenster in Cooke County, has since January 2013 represented Motley County in the Texas House of Representatives. Motley County was created on August 21, 1876, from Young and Bexar counties. It was organized on February 5, 1891. The large Matador Ranch, established in 1882 by a syndicate from Scotland and still operational after it was liquidated in 1951, is located in Motley and five adjoning counties. The first white child in Motley County, Nora Cooper, was born in 1882 near what is the now ghost town of Tee Pee City, a camp operated by buffalo hunters and later the headquarters of the Texas Rangers under Captain G.W. Arrington from 1879 to 1881. In 1913, the eight-mile long Motley County Railroad was chartered with money from more than ninety investors. It ran through unfenced ranch lands in the county before joining the Quanah, Acme and Pacific Railway at Roaring Springs. This track continued to operate until 1936. In 1927-1928, Dr. Albert Carroll Traweek, Sr., an investor in the Motley Railroad, established the Traweek Hospital, which was turned over to the county in 1991 and became the Motley County Historical Museum. A section of Motley County called "Whiteflat" was named for the tall white needlegrass which covered the flat prairie land there. A post office was established at "Whiteflat" in 1890. At its height, the rural community had four grocery stores, three service stations and garages, two cafes, a hardware store, two gins, and three churches. A one-room school opened in 1890 and was replaced in 1908 by a four-room structure. In 1922, a two-story brick structure was erected for the Whiteflat School, which also served as the community gathering place. Whiteflat declined during the Great Depression and the Dust Bowl of the 1930s, and even more so during the deluges that plagued the area from 1942-1945. The school closed in 1946 and was consolidated with those in Matador, eleven miles to the south. The churches disbanded in the 1960s. The post office closed in 1966 upon the death of the last postmistress, Ida Morriss. The remaining retail business, a grocery store and service station, closed in 1968. The two-story county jail was erected in 1891, the year that Motley County was incorporated. County Judge Henry Harrison "Hank" Campbell (1840–1911) and the four county commissioners at the time awarded a construction contract to local builders J.F. Aiken and J.T. Cornett. Cells were on the top floor, and the jailers' living quarters were on the lower level. The first courthouse, also built in 1891, later burned, but the jail remained a symbol of Motley County's frontier heritage. The jail is undergoing renovation for historic preservation purposes. The Motley County Library has been housed since 1986 in the Moore Building, a brick structure constructed in 1916 after a fire swept through downtown Matador and destroyed wooden frame buildings. The Moore Building was previously a grocery store and a butcher shop. The library had been within the Matador school facilities until a tornado struck in 1984. With the help of a Meadows Foundation grant, the Moore Building was renovated so that it could house the library. An adjacent library annex building is used for storage, as a genealogical room, and for meetings and social events. An historical mural at the library was painted on canvas by Joe Taylor of nearby Crosbyton, Texas. Taylor includes in the mural Quanah Parker at Roaring Springs, Judge Henry H. Campbell in his dugout prior to the establishment of the Matador Ranch, Dude Barton, an honoree of the National Cowgirl Hall of Fame in Fort Worth, and Shannon Davidson, a long-distance rider who won a Hollywood movie contract. According to the U.S. Census Bureau, the county has a total area of 990 square miles (2,600 km2), of which 990 square miles (2,600 km2) is land and 0.2 square miles (0.52 km2) (0.03%) is water. As of the census of 2000, there were 1,426 people, 606 households, and 435 families residing in the county. The population density was 1 people per square mile (1/km²). There were 839 housing units at an average density of 1 per square mile (1/km²). The racial makeup of the county was 87.38% White, 3.51% Black or African American, 0.63% Native American, 0.14% Asian, 0.14% Pacific Islander, 6.31% from other races, and 1.89% from two or more races. 12.13% of the population were Hispanic or Latino of any race. There were 606 households out of which 26.60% had children under the age of 18 living with them, 60.20% were married couples living together, 8.70% had a female householder with no husband present, and 28.20% were non-families. 25.70% of all households were made up of individuals and 15.30% had someone living alone who was 65 years of age or older. The average household size was 2.35 and the average family size was 2.82. In the county, the population was spread out with 24.00% under the age of 18, 6.00% from 18 to 24, 21.10% from 25 to 44, 25.20% from 45 to 64, and 23.70% who were 65 years of age or older. The median age was 44 years. For every 100 females there were 101.70 males. For every 100 females age 18 and over, there were 92.90 males. The median income for a household in the county was $28,348, and the median income for a family was $33,977. Males had a median income of $25,395 versus $13,333 for females. The per capita income for the county was $16,584. About 13.90% of families and 19.40% of the population were below the poverty line, including 35.30% of those under age 18 and 13.80% of those age 65 or over. ^ "TABC Local Option Elections General Information". www.tabc.state.tx.us. Retrieved July 29, 2018. Historic Motley County materials, hosted by the Portal to Texas History. This page was last edited on 5 December 2018, at 01:27 (UTC).